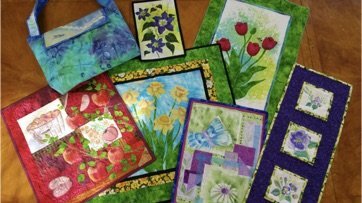 QUILTING CONFIDENCE ACADEMY IS BACK! Do you wish you had more confidence in your chosen method of quilting, whether it be on a long arm or domestic machine? Join us for an intensive quilting workshop lecture series taking you from core knowledge through advanced quilting design and free motion mastery. Join us for this amazing series, finishing the series with a quilt showcasing your machine quilting skills. Create your stunning, bold palette to showcase your quilting skills. Thursday July 26 1-5 p.m. Learn the basics of quilting with your home machine. This is a strongly suggested prerequisite for the design classes to follow. Instruction will be given in how to prepare your quilt for machine quilting, options in handling the quilt top with easy and ways to eliminate friction as well as exercises for the fledgling machine quilter. 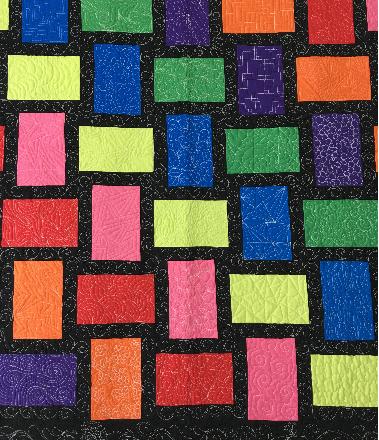 Bring your machine to this workshop to work on the basics of machine quilting skill. An additional optional instruction session will immediately follow this workshop to transfer these skills to a long arm machine. Saturday July 28 1-6 p.m.
Support your free motion skills with the assistance of these helpful tools and techniques. Monday July 30 10 a.m.-12 p.m. Learn the basics of free motion quilting design. Bring your quilt tops to discuss design options! Learn how to use motifs and themes to unify quilting in your quilts as well as how to best tackle free motion quilting of pieced blocks. Monday July 30, 1-3 p.m. Learn 49 free motion fill patterns. Never be at a loss on how to fill a quilting space. Twelve fill patterns covered daily, with muscle memory emphasis and cue reminders. There will be assigned homework daily to transfer the designs to your quilt sampler. Tuesday-Thursday July 31-Aug 2, 1-3 p.m. Learn ten botanical patterns to use in your quilting creations. Mix and match for a floral bouquet of beautiful quilting design options! Learn how to approach design options for borders. Special focus will be placed on how to incorporate feathers into border patterns. If you complete the entire workshop series and the assigned homework, you will have a completed sampler quilt with 65 quilting designs! We need a minimum number of students to hold these workshops so if you sign up with a friend you receive 10% discount on the book! Join us for this adventure into creativity! The summer art quilt series will have three target projects: a tulip wallhanging, (shown in the above photo), a zippered pouch, and a landscape with a focal point of your design! The workshop format is one hour of direct instruction, followed by two hours of guided instruction with ideas, inspiration, strategies and encouragement to complete the intended target projects. Workshop series is $349, $50 nonrefundable deposit required to hold your spot. Space is limited so sign up early! Dying fabric immersion, sun printing and and ice dying techniques. Dye up to three yards of cotton, which are needed for the three class projects. Direct application of fabric paints/dyes, spray, stencil, monoprinting and sky painting techniques will be explored. We will provide you with stencils/plans to produce several projects for this series. Paint/dye up to three yards of cotton. Creating a compelling starting point to launch your art quilt. Tools and basic art principles to inspire, challenge and bring an element of whimsey and a plan to layer and stitch your designs. Develop a plan for a ufo, and a newly dyed piece of fabric with lots of help and inspiration to spare. Tips for stitching and adding elements of thread art to your quilt. We will continue to enhance the design with paint, fibers and markers Quilt the backgrounds of tulip wall hanging and and apply appliqués of tulip quilt. A variety of embellishment techniques will be used to create a one of a kind zippered pouch using the quilted backgrounds previously stitched. Bling, foil, stamps, foil, and many more techniques will be discussed. We will complete the embellishment aspects of our quilt projects. Bees, floral elements with style, are just too much fun, you'll will unleash your creativity. Guaranteed to make you smile! Traditional and not so traditional ways to frame, finish and display your new projects.We will finish up the tulip and quilted bag projects. Layered Landscapes with YOUR hand dyed sky/landscape fabrics. We will help you find your way into your landscape quilt by assisting with planning your focal point, layout and begin execution of the background elements in a land of your imagination. Techniques for preparing and executing your own layered focal point appliqués. Saturday July 21 1-3:30 p.m.
Includes the entire 4 days of guided instructional series (and lots of encouragement), handouts, patterns, 4 yards of prepared for dyeing cotton, 4 yards of muslin for backings, quilting cotton, batting, bag zipper, stabilizers, hardware, pre cut appliqué’s for the tulip quilt, embellishments (gotta love that bling! ), paints, dyes, access to class stencils studio tools for the two class projects. We've made it easy to create with confidence by gathering all the required supplies for your enjoyment (and no mess to clean up for you!) Preferential placement given to those who opt for the full series of workshops! Six hours of guided instruction, patterns and access to studio supplies. (no fabrics, batting or background are provided). $25 non-refundable deposit required to reserve your spot. These workshops require a minimum registration in order for the classes to hold. Invite a friend to join you and double the fun!